I am glad to announce that we were featured on PCWorld, one of the greatest computer magazines in the world. Cryptolocker and CryptoDefense have proven to be a highly profitable business warped around the anonymity of cryptocurrencies and the TOR network. You can expect more of this resurgent type of malware to sweep the Internet and spread as wildfire and, as you are reading this article, someone is writing the next cryptovirus that will enter the scene tomorrow; and I am not joking. The only fireproof measure against these nasty threats is backup using non-rewritable media such as DVD-R's and Blueray disks. 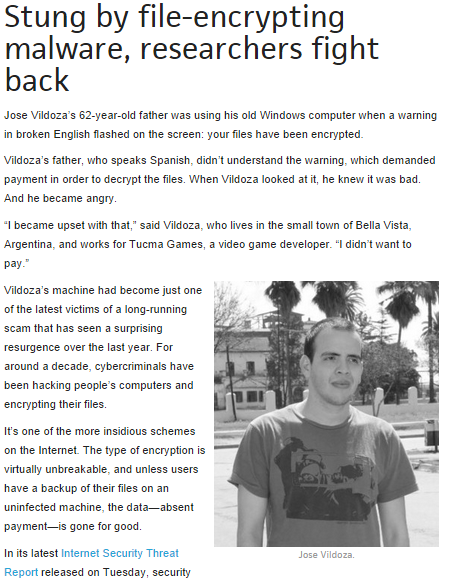 Cloud storage such as Dropbox seemed safe at first glance but víctims also reported they have lost their files there. There is little (to say the most) Antivirus software can do once your files have been encrypted simply because removing the malware will not return your data to its original form unless you have the key. So, better be prepared than sorry: Backup tour files. I'll update this blog soon... Keep in tune!